While public school kids may be sent off on their own as soon as they graduate, homeschooled kids often benefit from continued mentoring from their parents while gaining experience with teachers, tests, and grades. This is something we homeschoolers tend not to talk about, and I think we should. The first year after high school graduation may find you in a supportive role, similar to a school guidance counselor. Remain an involved homeschooling parent just a bit longer while your new graduate eases into independence. This is the time to trust your parental instinct, and not worry what others think! Please note: Most of the homeschoolers I work with start college at their local California community college, so some of the information/links reflect that. Lines are often shorter than they will be in the fall, and summer isn’t as overwhelming. 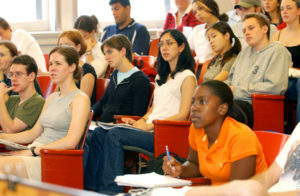 A college success or learning strategies class can be a great first college class. Students learn study tips and how to use college resources while they get over the college jitters. Your teen will need to take a math/English placement exam. This exam will not impact admission at the community college. However, if the test results indicate that your teen is not ready for college level math or English, he will have to take remedial classes first. Since all students need to take this test, it may be less crowded if taken early, before registration time. While a high SAT score might help your teen get a scholarship, taking the test is not an enrollment requirement at community colleges. There is so much to learn about college! A little bit of preparation in the weeks before the term starts will make the transition easier. If your teen knows the lingo and expectations, he’ll be ahead of the game! Go to an orientation. Never miss an opportunity that is offered to help with the transition. Some community colleges encourage parents to attend too. If you are invited, go and then discuss what you both learned afterward. Explain the meaning of words used in college. Google college terminology or college definitions for websites such as College Prep 101 and About.com College Life . Encourage your teen to memorize his social security number. Discuss the importance of following college rules and deadlines carefully. Colleges don’t bend these rules, so knowing that can save some grief. Give your teen several chances to experience the campus before school starts. The more times you visit various parts of the campus, the more relaxed your teen will be when school starts. Encourage your teen to become familiar with the college website, college resources, and also the library website. Learn where the parking lots are, and emergency phones. Drive or walk around a bit and sightsee. Get the college photo ID card before classes start because the line will be shorter. Help your teen find the location, and then go wait in the car or on a bench somewhere. Talk about tips for success – paying attention, being on time, sitting up front, having pen and paper, cell phone ringer turned off (no texting either! ), asking questions, AND continuing to learn as they did as homeschoolers, even if it’s not required! Since some homeschoolers have never been graded, they need to learn about the importance of their GPA. The GPA will permanently follow them and might impact things they want to do in the future – like transfer to a university. Review the class syllabus after the first day, and explain anything confusing. This is their class contract, and teachers expect it to be followed. Suggest that your new college student write all deadlines on a calendar. Some homeschoolers don’t have experience with deadlines, and may need to fine tune their time management skills. Talk about the importance of doing some extra credit if it’s offered, and also completing work on time, if not early. Be available to talk. Don’t demand to proofread a paper or help study for a test, but offer. Your teen may or may not need a bit of help in the first year. It’s ok to accompany your teen when he enrolls. Lots of parents will be there! Your role is not to take over, but be nearby as an advisor when needed. During enrollment, your teen will appreciate it if you are neatly dressed and speaking quietly so that you blend in. He may need you there, but he’d prefer that you not be the parent that is noticed by others. If you have younger children, it would be ideal if you could leave them with someone while you focus on your new college student. Since your child is about to spread his wings and fly, this is going to be one of your last special moments together. Make them count! Don’t contact teachers for any reason (only your teen should contact them). This can be a hard one for homeschool parents since we have been in control of our child’s education for a long time! Don’t leave things to chance and assume your child is meeting all deadlines. Yes, I know that conventional wisdom is that they need to do things themselves, but guide them for just a bit – they won’t need you much longer, but your involvement may make a huge difference in their success! #1: Suggest that your teen register online at midnight on the first day of registration. Classes fill up fast and it’s important to register as soon as you can. Mark the date on your calendar and help your teen do this! #2: If your teen has a 3.5 GPA after completing 12 units, he may want to join Phi Theta Kappa, a worldwide 2 year college honor society. Members often receive priority registration, which makes it easier to get into the classes that are needed. There are also other benefits (participating in leadership, scholarships, and recognition at graduation). Do help plan his schedule and also introduce him to the published graduation requirements as well as the IGETC – Intersegmental General Education Transfer Curriculum if he plans to transfer to the CSU or UC system. FAFSA Federal student aid for college students. Check “homeschooled” instead of “private school” to avoid delays. Normally, you would check “private school” so FAFSA is the exception. Ratemyprofessors.com – see what other students think of a teacher, but take the critiques with a grain of salt. If a student writes that a teacher is unfair because he expects students to attend class, perhaps that’s going to be a good teacher for your serious student! If every reviewer writes that they can’t understand the teacher because of his thick accent, or if he rarely shows up for class, you might want to look elsewhere. Save by buying or renting your textbooks online. Compare prices at Fetchbook. Textbooks are updated so often that you might be able to get a slightly older edition and save $50 or more. Often the new edition has a different cover and a slight rearrangement of pages, and sometimes teachers say it won’t matter. Your child can email the teacher and ask. When the class is over, sell the textbook at the bookstore or online at Half.com or Amazon . Sell it immediately before that $150 book becomes worthless because of a new edition! If money is super tight, college libraries have copies for use in the library – it’s not ideal, but it’s good to know about. You have spent many years guiding your child, and now you are gradually letting go in a way that best meets the needs of your child. Pay attention to signals that your child is ready to take over something you’ve been doing. You may be congratulated for being “done” with homeschooling, but the truth of the matter is that you aren’t quite done, but just doing it differently. People assume that once the child graduates they should be on their own, but independence doesn’t happen overnight. Help your kids just a little longer until they no longer need your help – it’s time well spent to ensure they successfully transition from homeschooler to college student. Written by Karen Taylor, posted on 27 March 2013 at 12:48 pm, and filed under Teens. Bookmark the permalink.